Can you imagine a country so proud of its heritage that it puts drop spinners on a national postage stamp? 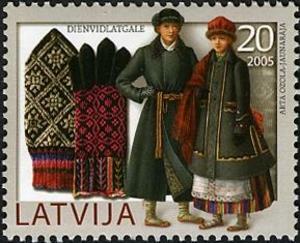 This 1961 stamp is from Jugoslavia, and it accurately depicts three spinners in traditional dress, sitting upon their sit-upon distaves and spinning wool with hand spindles. A country that so treasures its history that it puts an image of an ancient mosaic of a spindler on a stamp? This is a 2003 postage stamp from Tunisia. The caption reads "Spinner Mosiac." If anyone knows anything about the mosaic, please post it in the comments. Can you imagine a country that puts a spinner on its currency? 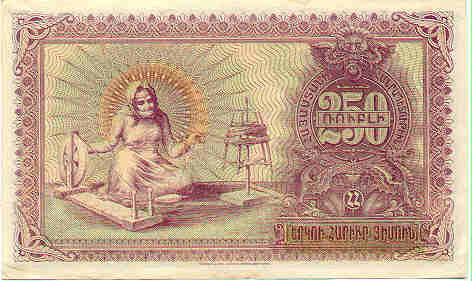 This is a 250-ruble note from Armenia, issued in 1919. It shows an elderly woman plying yarn from a swift with a charkha. I particularly like the halo-like sunburst behind her. 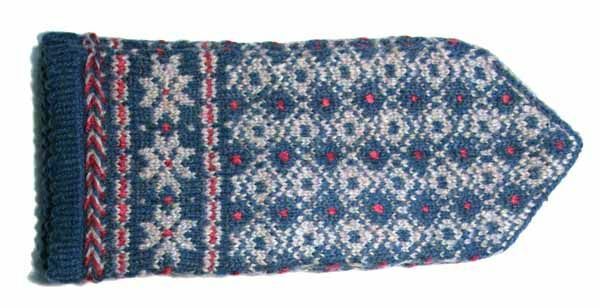 A year ago this week I blogged about the 9,000 Latvia NATO mittens here. I was made dizzy by all these mittens then, and I still am. For the last year I have been using the images from the mitten archive as my screen saver, and they delight me just as much now as they did a year ago. 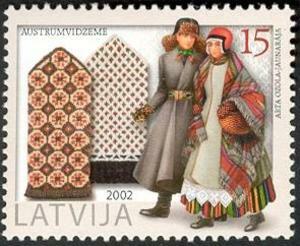 So, to re-affirm my love of Latvia and its mittens, I give you Latvian mitten stamps. Each stamp is a small work of art. 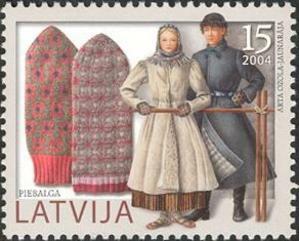 The stamps were issued between 2002 and 2005, and each bears both mittens and costumes from a different region of the nation. Can you imagine a country that values its handcraft traditions so highly that it puts them out for all the world to see in such a way? 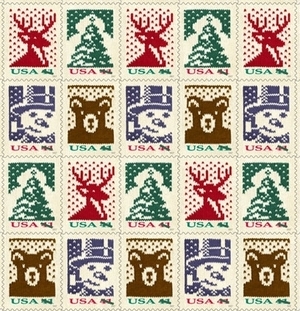 And, yes, yes, before you say anything, I do know that the US has issued knitting stamps. And I give them to you here. Oy. Well, ok. It is knitting of a sort. I'll give you that. Does anyone else mind that the images appear to have been knitted upside down? Or is that just me? Can you imagine a country that values its handcraft traditions so poorly that it puts them out for all the world to see in such a way? A young pig in Esquina, Corrientes, Argentina, has fleece like a sheep according to a certain news outlet. * Although the story appears in a few different places on the net, they all seem to point back to the linked story. "Meet the world’s first sheep-hog — a pig with its own fleece. Scientists are baffled by the strange swine — which they say is a pig “at heart” but with a woolly hide. The one-year-old is being raised on a ranch near the town of Esquina, 400 miles north of Buenos Aires, Argentina. It is a pig but has a thick fleece which needs shearing in summer with the other sheep because it suffers in the heat. Other pigs do not trust it." 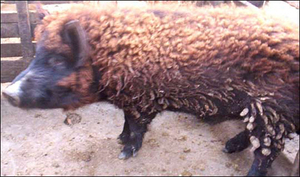 I've heard of a wolf in sheep's clothing, but this is a porcine of a different color entirely. Perhaps it envies the camelids? Or perhaps its mother spent way too much time watching a certain video. 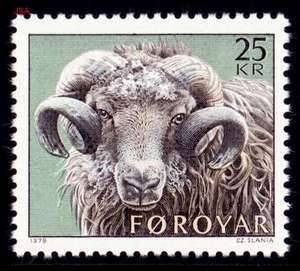 Can you imagine a country that is so proud of their sheep and sheepish heritage that they put a big old ram on their stamps? 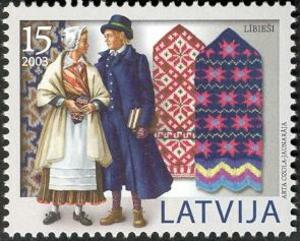 This stamp is a 1979 issue from the Faroes. (click to biggify) Isn't he a handsome fellow? 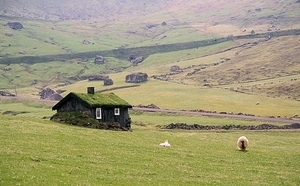 In Faroese the name of the country, Føroyar, means "Sheep Islands". 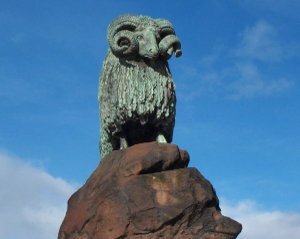 In some places, instead of statues of soldiers or politicians or horses, they put up statues of sheep. This lovely creature stands atop the Colvin Fountain in the middle of the the High Street in Moffat, in Dumfriesshire in the Borders region in the south of Scotland. 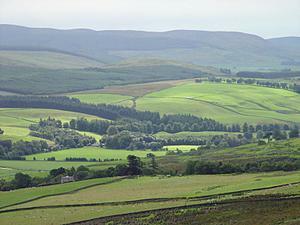 It was donated to the town in 1875 by William Colvin to celebrate Moffat's long history with the sheep and wool trade. 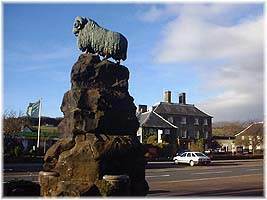 In the land of my people , sheep have been a part of peoples' lives for at least a thousand years, and a sheep statue is the central icon of that history. Is it any wonder I ended up in the world of fiber? In some countries they put spinners on their currency. This is a 50-franc note from France, issued in 1942. 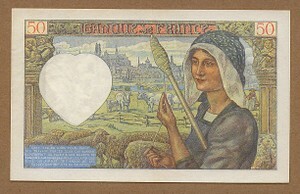 Some countries actually put sheep on their currency. Iceland, of course. That's Mount Hekla, an active volcano, in the background. This is the annual autumn roundup, the rettir, when all the sheep that have been grazing, lambing, and living wild in the highlands since spring are gathered together and driven in their thousands down to their home farms in the lowlands for the winter. If you ever have the opportunity to go to Iceland, be sure to coordinate it with this amazing event.